Have you guys already checked out Justin Bieber’s autobiography First Step 2 Forever: My Story? The book was released last week and I’m sure thousands of JB fans are reading it in their beautiful pink bedrooms before saying good-night to all dozens of Biebs posters on their walls. In case you’re interested in the book but still haven’t bought it, here are some highlights that I find absolutely hilarious. 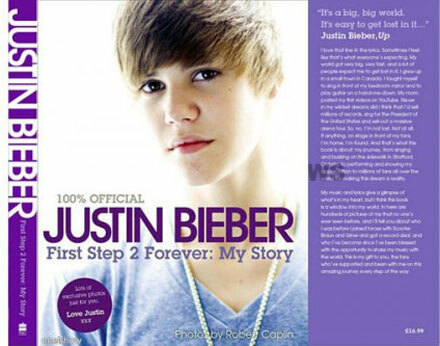 The new thing I’ve discovered about Justin Bieber from First Step 2 Forever: My Story? He’s crazy about Chuck Norris just like millions of other guys round the world! Justin Bieber’s memoir First Step 2 Forever: My Story chronicles Biebs’ two years in music industry as well as gives an inside look at his childhood, including cute childhood photos and songs’ lyrics. Is Jennifer Aniston good at cooking?